c/w 4 mounting holes drilled to accept 3/8" bolt for floor fastening. - Round tables - up to 30"
- Rectangular tables - 1 Base up to 24"x 30" / 2 bases up to 30" x 60"
- Rectangular tables 1 Base up to 24"x 30" / 2 bases up to 30" x 60"
- Custom height orders are welcome. 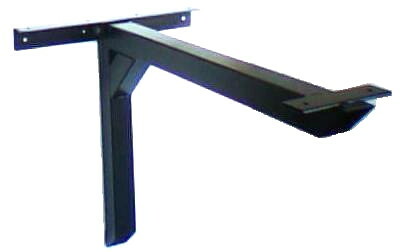 We can cut table bases column to any height up to 40"
Bolt Down Base Standard Dining Height 27 1/2"
Bolt Down Base Bar Height 40"
- Custom orders are welcome. - Height at 28"x 3" diameter single pole. $79.00 each. - Top plate with 4 x 3/8" holes for table top fastening. 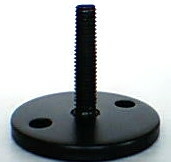 - Bottom plate with 2 x 3/8" holes for floor fastening & set screw to hold the leg in place. 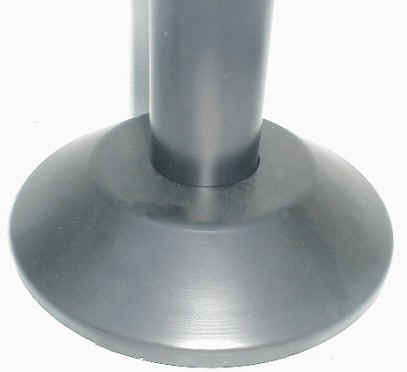 - Height at 28"x 3" diameter single pole. $195.00 each. - Rectangular Tables up to 24" x 36"
- Square up to 36" x 36"
If your table size does not fall within these specs, contact us for recommendations or download Table Base Size Recommendation.pdf.